Magnificent Appenzell Lace Tablecloth, Napoleon's "Battle of Eylau"
An impressive and rare Appenzell lace banquet cloth and napkins with a design that depicts "The Battle of Eylau" fought by Napoleon in 1807. 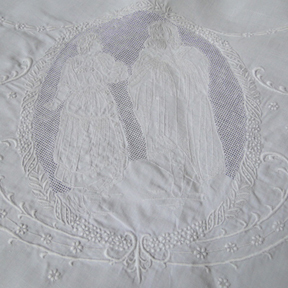 The tablecloth has the most exquisite Appenzell whitework embroidery, with a design that is quite grand and ornate. The level of workmanship is of the highest order, this is the very best of Appenzell embroidery. There are large vignettes of Napoleon dressed in full regalia, numerous battle scenes with soldiers on horseback. This is a truly perfect cloth! A work of art! Rare & Exquisite Tablecloth, The Epic Poem "The Song of the Nibelungs"
A extraordinary tablecloth that depicts the story of the famous dragon slayer "Siegfried" and his epic quest. The poem was based on a Pre-Christian Germanic hero from the 5th and 6th Century, and written by a unknown author duting the 12th C. This epic poem was used later by Richard Wagner in the opera "The Ring". 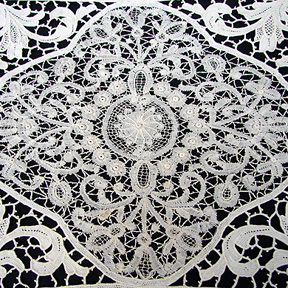 The scale and quality of techniques of needlework, design and workmanship are quite magnificent. A remarkable tablecloth! 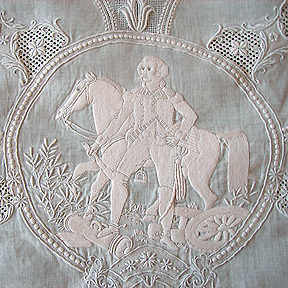 Exquisite needlepoint Heraldic shields on this amazing round 80" cloth. The tablecloth was probably made during World War I, and commissioned for someone quite important. The central Heraldic shield measures apprx. 13-14" and depicts a Heraldic shield for the coat of arms of Belgium. This is surrounded by the coat of arms for the Allies, United States, England, France, Russia, and other Allies. Magnificent details in the crests. A work of art! 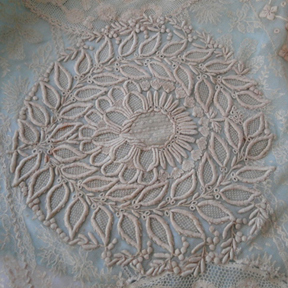 Fine workmanship and a superb design on this lovely round linen tablecloth. 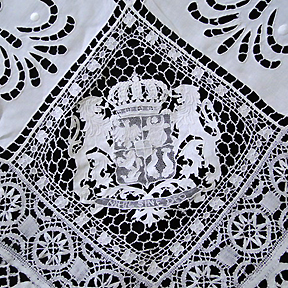 The design has large ornate medallions containing portraits of assorted royals worked in needlepoint lace. The medallions depict "Louis XII", "Louis XVI", and "Henry IV 1596", and are surrounded by oval vignettes of filet cherubs. 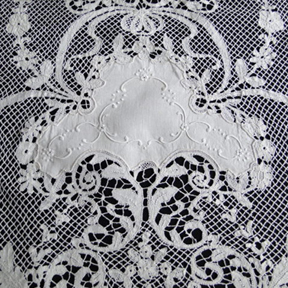 There is reticella lace, needlepoint lace, cutwork, filet lace, and raised satin-stitch embroidery. A work of art! The very best appenzel work with a design commemorating a historical event. Two central vignettes contain historical figures, one in full regalia by the side of his horse, the other vignette comprised of two orators or judges. 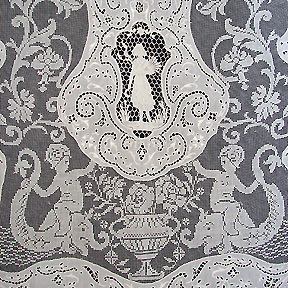 Lavish rococo embellishments are enhanced by lovely cherubs. Superior both in design and workmanship. 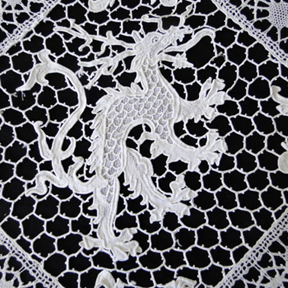 This outstanding Appenzel lace tablecloth came from the estate of the Woolworth Family of F.W. Woolworth. The Woolworth's were major collectors of the finest art and antiques. This magnificent tablecloth is entirely encrusted with handwork, with 18 large roundels filled with figural scenes from Medieval England. The majestic scale of workmanship is quite breathtaking! 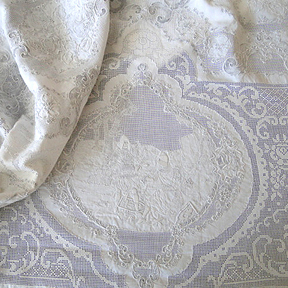 A fine Italian needlepoint linen round cloth with a wide border of superb needlepoint. A ornate design of a hunting scene with stags, wild boars, horses, a castle, and assorted figurals in a forest scene. Fine detailed work and a excellent design. A beautiful tablecloth made during World War I. Possibly made in Belgium, rare to find, these cloths were usually made as gifts to important people who helped Belgium during World War I. The symbolism of the needlepoint animals include the Bear(Russia), the Lion or Unicorn represents the United Kingdom, the Gallic Rooster(France), and Lion(Belgium). The Dragon has different interpretations. An important cloth for collector! A lovely large oval table runner measuring apprx. 82" by 36-37". 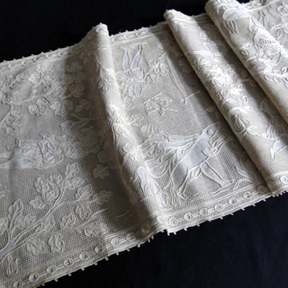 The table runner is quite elegant, with good quality linen and a very wide border of superb cantu lace. 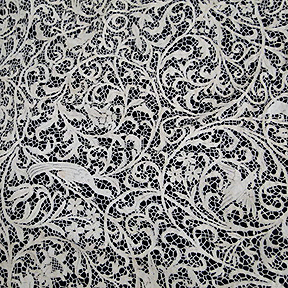 An ornamental pattern of intricate meandering vines, florals, and birds in the design. A gorgeous tablecloth with a superb design and excellent workmanship. The cloth has twelve matching napkins. There are numerous round vignettes filled with the finest needlepoint. 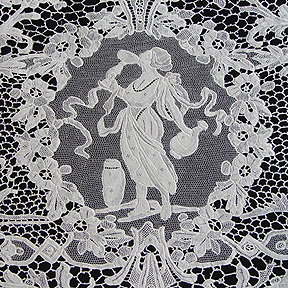 Classical figurals throughout this lovely cloth. A very beautiful banquet tablecloth with a aesthetically pleasing design. This cloth seems to have been influenced by "Art Noveau" designs. The round vignettes contain elegant ladies dressed in classical clothes surrounded by birds and garlands of flowers. Each vignette has a different figural. The cloth is heavilly embellished with the finest hand-work. 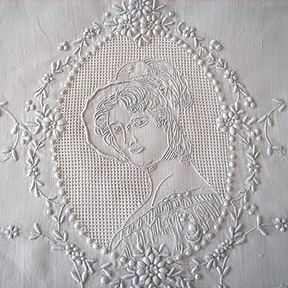 Superb Reticella, raise satin-stitch embroidery, and bobbin lace. A stunning tablecloth! 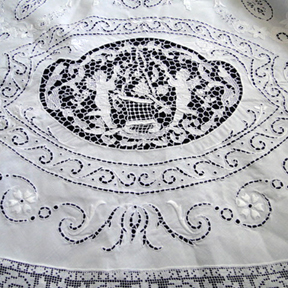 A very ornate round Italian linen tablecloth with highly embellished design. 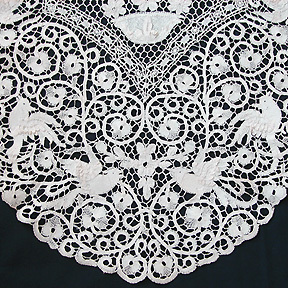 There is masses of whitework embroidery, scrollwork, and floral whitework medallions. 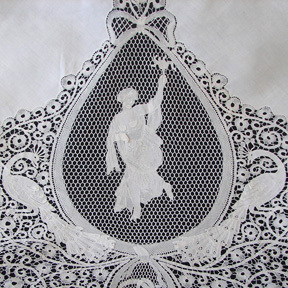 In the design there are numerous oval shaped vignettes filled with fine filet lace and larger oval vignettes filled with needlepoint lace cherubs playing in a garden. A fine ornate design and superb workmanship. 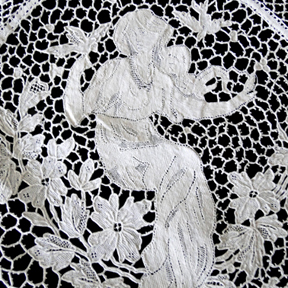 Circa late 1800's, a beautiful Italian Bobbin lace banquet tablecloth. The design is quite extravagant with swirling and undulating vines and flowers surrounding the central vignette. Two eagles with crowns are then surrounded by birds in flight, rabbit or hares, peacocks, and dogs. There are appr. 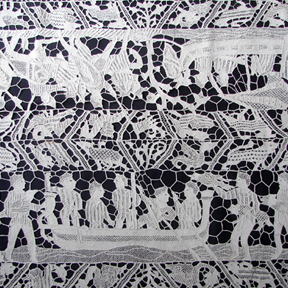 over sixty animals worked into this cloth. 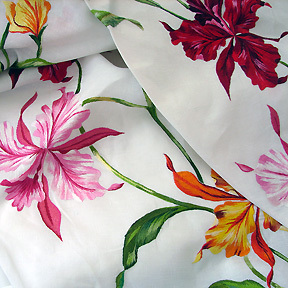 A stunning tablecloth with a wonderful design! A rare Buratto placemat set purported to have belonged to the estate of the great industrialist and philanthropist Andrew Carnegie. The set consists of placemats and one ornate long table runner. 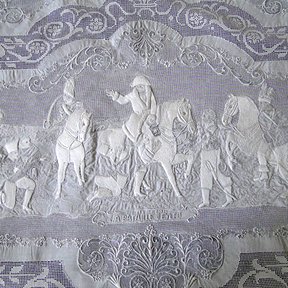 The table runner has figurals in classical dress hunting in a forest, with various scenes of the hunt. 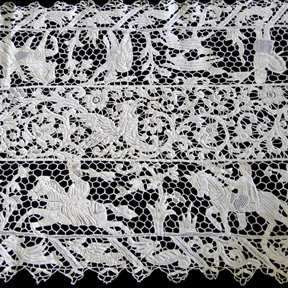 There are dogs, numerous birds, deer, archers in the ornate runner, and each placemat has different scenes of the hunt. A set like this is extremely difficult to find. 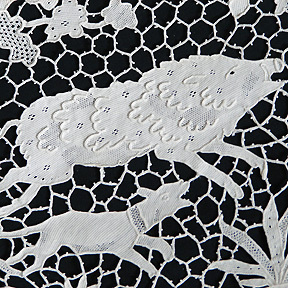 Astonishing embroidery! Measuring apprx. 125", this beautiful cloth is quite a work of art! This wonderful cloth was part of a fantastic New York estate. 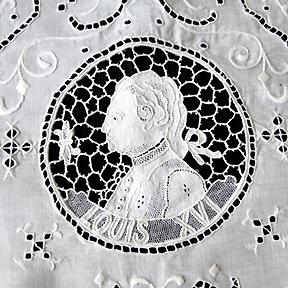 This prominent family had many linens specially commissioned by Porthault and here is a true example of the finest work done by Porthault embroiderers. There are apprx. 16 large embroidered flowers, 18 smaller ones with a lovely vine and leaf garland. As the last word, I would simply say "Absolutely magnificent". A superb pair of curtains measuring apprx. 120" long with elobarate wide inserts of Italian bobbin lace. 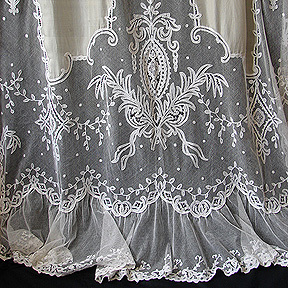 It is extremely rare to find curtains like this in unused condition. Quite luxurious in every respect, the curtains came from a prominent New York estate, they were preserved properly. Please also see the other curtains from this estate. A set of twelve needlepoint lace placemats and one table runner. There are six different vignettes filled with cherubs enjoying the rites of spring. Cherubs carrying wheat sheaths, playing musical instruments, dancing, picking grapes, surrounded by garlands of flowers, assorted fruits and vines. A true work of art!!! A rare and truly magnificent appenzel wedding sheet. 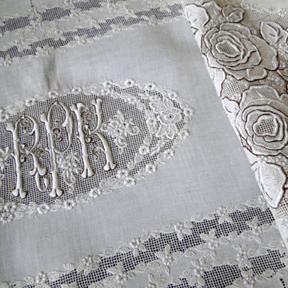 The quality of whitework is of the highest order and the design absolutely brilliant. A large central cherub stands amidst wheat sheaths and flowers, with ornate scrollwork meandering throughout. Two vignettes are filled with love birds facing each other, with two other oval vignettes containing hearts. There are vases overflowing with flowers and a wide border of needlepoint lace. Made for a member of the Royal Family, intetwined "C" initials with a embroidered crown at the top. Elaborate Italian Needlepoint w/ Figurals & Ship, Etc. Circa late 1800's - early 1900, a elaborate table runner with a dood design of ships. It looks almost like a royal medieval fishing party. Men in regalia, with heraldic shields on horses greet the seafairers. The inner and outer border contains assorted wild boars and other animals. 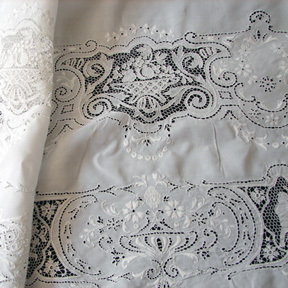 A stunning tablecloth that is absolutely encrusted with fine raised satin-stitch embroidery, reticella, needlepoint, cutwork, and filet lace. 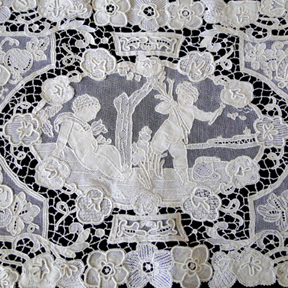 The center of the cloth is embellished with fine work and surrounded by a wide border of filet lace containing figurals and animals in a lush pastoral scene. Our photos could not do justice to this beautiful cloth! 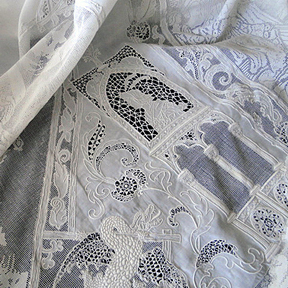 A beautiful design and superb workmanship on this lovely Italian reflectory cloth. The design is quite elaborate with large filet cherubs and scattered vignettes with needlepoint figurals carrying wheat sheaths. 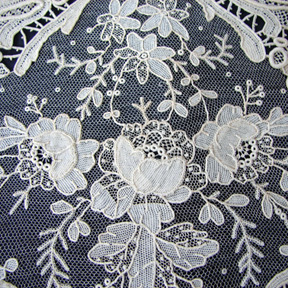 The linen is heavily embroidered with large designs worked in filet lace, with fine filet vignettes filled with birds. A lovely cloth! 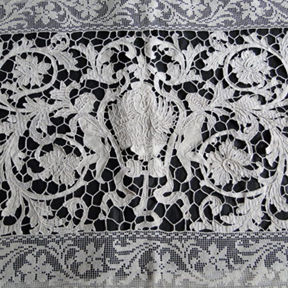 Circa 1900's, a ornate bobbin lace table runner with a very good design. The large central oval is surrounded by birds, urns, and flowers. There are apprx. eighteen birds with fine raised three-dimensional wings. A lovely design and good quality workmanship. 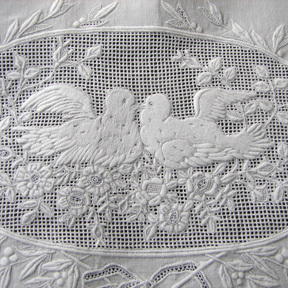 A elegant 90" round linen tablecloth worked with delicate fine appenzel whitework embroidery. The design around the center has 10" large oval vignettes filled with ornate figurals in elaborate period costume. The elaborate vignettes are connected by fine oval flower wreaths accented with bows, scattered tiny flowers, and ornate scrollwork. The bottom decorated with larger floral wreaths and bows, with scalloped edges. A beautiful cloth! A lovely design on this elaborate placemat set w/ matching napkins. Large oval medallions contain a lady and gentleman in period dress. A flowing design surrounds these vignettes with leaves and meandering vines enhancing the design. Twelve placemats and twelve napkins. A truly beautiful set of twelve placemats and napkins with a long table runner and another table center. Fine appenzel roses and tiny garlands of flowers are enhanced with fine drawnwork. A central oval vignette contains a elaborate embroidered monogram. Superb workmanship and a excellent design. A very pretty placemat set! 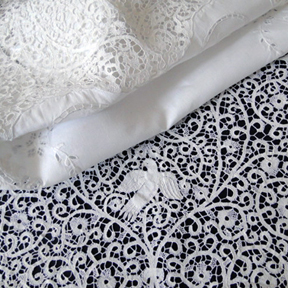 The combination on a inner linen decorated with whitework embroidery and fine handmade lace is very elegant. There is one long table runner that is very ornate with three large shaped linen vignettes with whitework embroidery measuring apprx. 52" by 19" wide. There are ten matching placemats that measure apprx. 16 1/2" by 10 1/2". 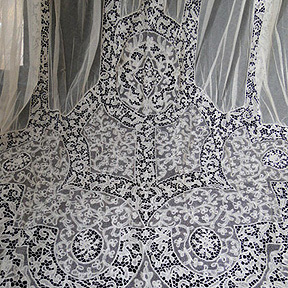 A rare Buratto bedspread or panel with an amazing mirror image design. The central design of a large ornate urn with architectual Gargoyle is surrounded by large undulating vines with masses of animals figurals. 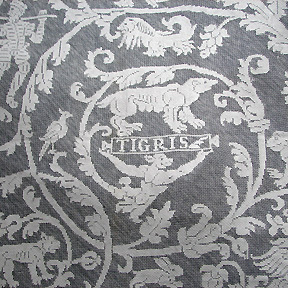 Monkeys, lions, antelope, parrots, unicorns, figurals, and the word "Tigris" are incorporated into the design. An exceptional piece! A very beautiful and ornate needlepoint table runner with masses of ornate scrollwork, and shaped oval vignettes filled with rosaline lace with raised perls. This beautiful handmade table runner measures apprx. 105" by 12" wide. A beautiful round cloth with the very best workmanship. The design is quite superb, undulating flowers and vines, with large teardrop vignettes filled with Point De Gaze. Both the work and design are superior. Excellent needlework on these five lovely coasters. A central wild boar has a heraldic banner underneath. This is the heraldic design for Sir Francis Bacon and his descendants. The banner reads "Mediocria Firma", the different interpretations are "Moderate things are surest", "Mediocrity is the Way", etc. A wooden plaque found over the fireplace at Old Gorhambury House has the identical Bacon crest. Superb workmanship and design. Circa 1890-early 1900's, a pair of superb curtains that measure 155" by 62" for each panel. The curtains are graceful and so very elegant with large fine insets of cream silk, and surrounded by highly decorative tambour lace. This set was probably a special commission as it is the only pair I have come across after many years of selling lace items. A beautiful set! Circa early 1900's, a very ornate Italian needlepoint bedspread with superior workmanship. The design has a central vignette filled with cherubs, large oval vignettes filled with florals and masses of scrollwork. A beautiful design on this large bedspread. A fine Italian needlepoint measuring 155" by 75" wide. The design has large urns on each end overflowing with flowers. Ladies in classical dress are in the four corners and all around the cloth cherubs celebrate a festive occasion. There are cherubs wheeling barrows of fruit, and also tilling the ground and collecting wheat. There are hunting scenes, with dogs, birds, rabbits, and goats. 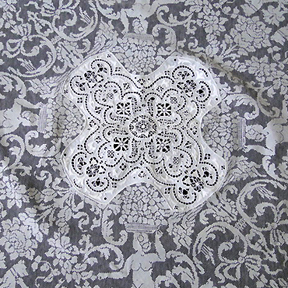 The tablecloth has ornate scrollwork ans overflows with flowers. 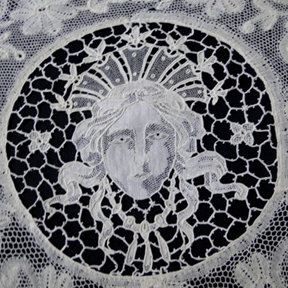 A beautiful design and good quality Italian needlepoint. A brilliant design on this delicate Normandy bedspread. 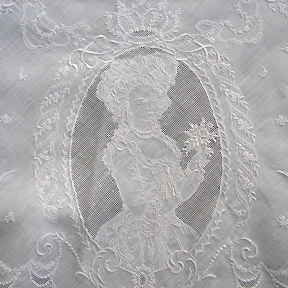 The design is quite beautiful with large Fond De Bonnet embroidered round vignettes combined with raised satin-stitch embroidery, limerick, tambour, and cantu lace. The orignal luminous blue-green silk is gently attached as a liner and the cloth is enhanced with matching gorgeous silk rosettes. 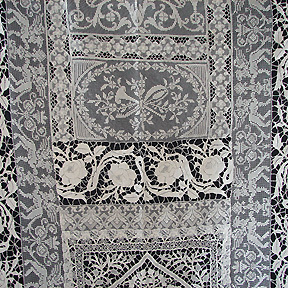 A very beautiful panel or bedspread with intricate workmanship and a very ornate design. A large central needlepoint design is surrounded by large needlepoint roseland. Assorted mythological lions, swans, etc., make this extremely ornate! A very ornate Italian banquet tablecloth measuring apprx. 208-210" by 68" wide. The cloth has a elaborate design with figurals and overflowing urns filled with fruit worked in needlepoint. 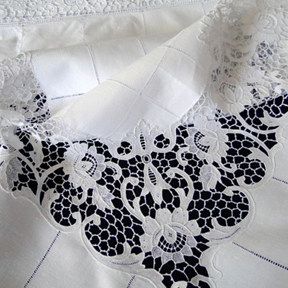 Along with askets with ribbons, fine raised satin-stitch embroidery, cutwork, and a scalloped filet edge. A very long hand-made needlepoint table runner measuring apprx. 85" by almost 16". The central panel contains gryphons, ornate florals, and vines. The outer border contains castles, birds, and men in armour, Horses, animals, and ships. There are ornate gazebo's and an assortment of birds throughout the lace. In good condition. Fine quality linen on this very elegant tablecloth. Measuring apprx. 69" by 62", with fine drawnwork and a wide insertion of needlepoint roses. The design is repeated on the edge of the cloth. 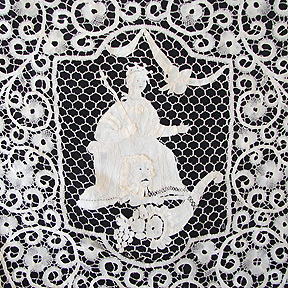 A ornate Venetian coat of arms needlepoint filet cushion cover. The design depicts the lion of St. Mark. The design of a lion and royal insignia, the words "Pax Tibi Mar Ce" on one side of the tablet and on the other "Evan Geli Sta Meus" translates as " Peace to you O Mark my Evangelist". The lion is flanked on either side by two cherubim amidst undulating vines and flowers. Superb design and excellent workmanship. 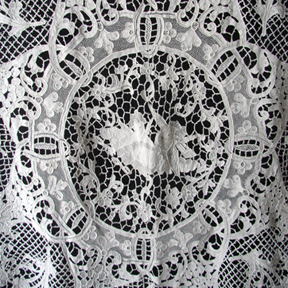 A lovely large linen tea towel with a extremely ornate design. 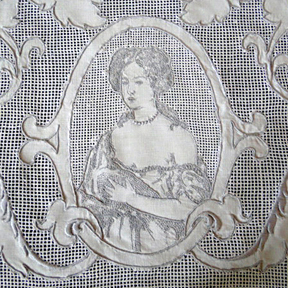 Excellent appenzel whitework embroidery, with a large oval vignette containing a portrait of a lady. Excellent design and workmanship. Measuring apprx. 48 1/2" by 25". A lovely cantu tablecloth measuring apprx. 90". A lavish central design is encrusted with fine needlepoint with shaped vignettes containing needlepoint cherubs. Fine raised satin-stitch embroidery, needlepoint, and cutwork adorn the linen, and in the larger vignettes there are wonderful figurals, lions, cornucopias, and peacocks. A brilliant round linen tablecloth measuring apprx. 86". A wonderful rococo design, with large oval medallions containing three-dimensional classical ladies. The ovals have ornamental peacocks on either side, with ovals containing deer, dogs, and a wonderful oval containing swans. A truly beautiful tablecloth! 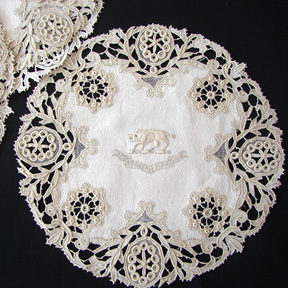 Excellent appenzel whitework embroidery on this lovely table center. A lovely design, large ovals filled with ladies dressed in 18th C. costume and surrounded by garlands meandering vines, and ovals filled with the finest drawnwork with pretty bows at the top of the vignettes.